Good news! 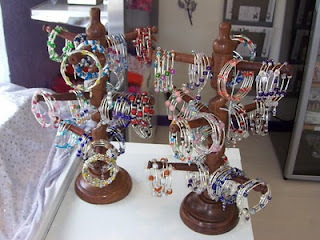 We have received a HUGE order of glass bangles. It will take weeks to organize the bangles so that we can make them available to you. Due to this, we are closing the store the week between Christmas and New Years. 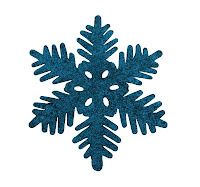 The store will be closed Dec 24 - January 3. If you have a special need during this time, feel free to email me direct, Jody@BeachcombersBazaar.com. If I can make special arrangements for you I will! Just got a TON of new bindi body stickers in! Seriously, like 40 new styles! 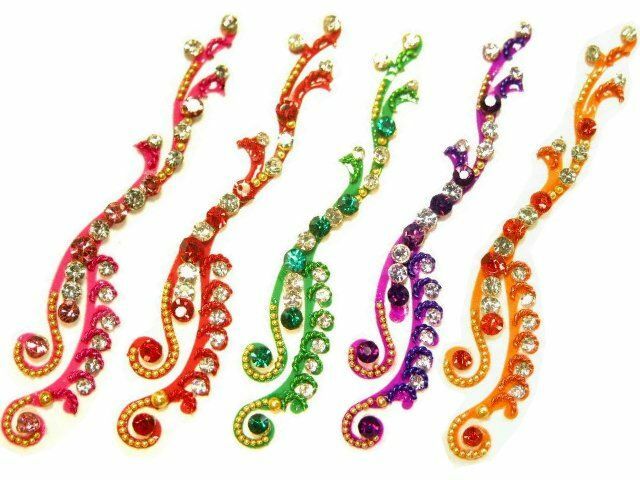 Ultra sparkle with tons of crystals on each bindi. 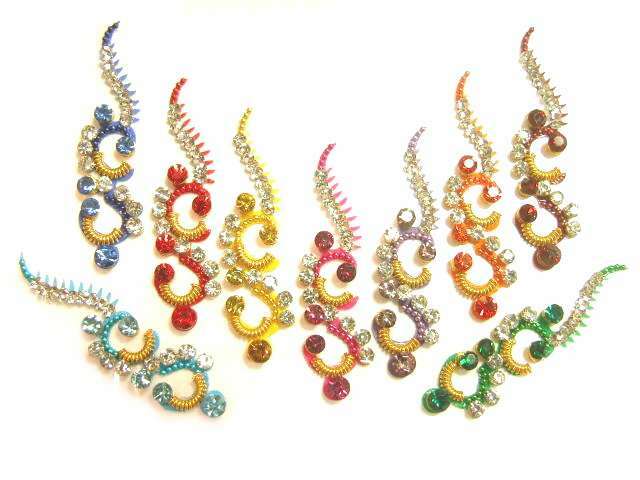 There is also a really nice selection of large show bindi. 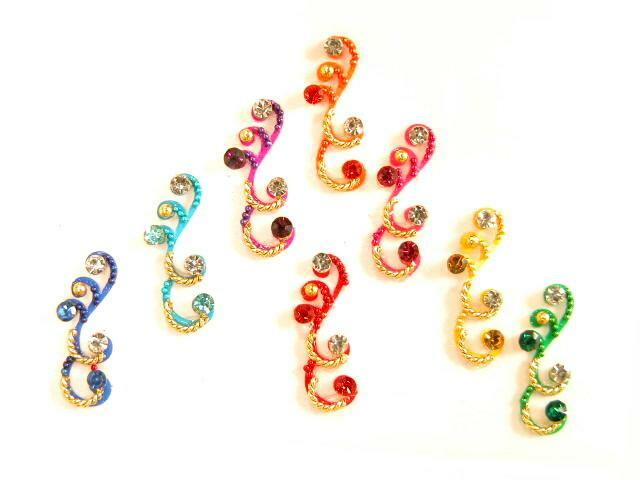 Bindi make great stocking stuffers or additions to envelope gifts such as cash or gift certificates. 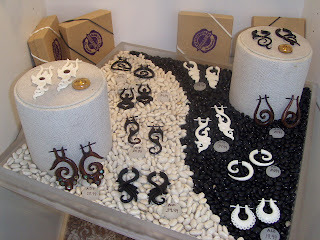 Remember bindi can be worn anywhere or on anything! Try them on your cheekbone or on your shoes! Time to decorate your body! Shop Bindi at our website or our Orlando store! Woo Hoo! They have arrived, and they are GORGEOUS! 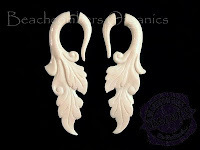 Our newest products are these fab new tribal earrings, Beachcombers Organics. 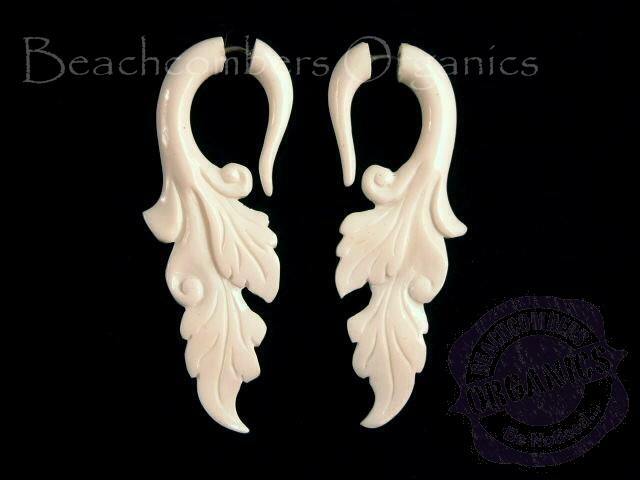 They are handmade in Bali of wood, horn, bone, and Mother-Of-Pearl. Stretched lobes and gauged ears not needed! 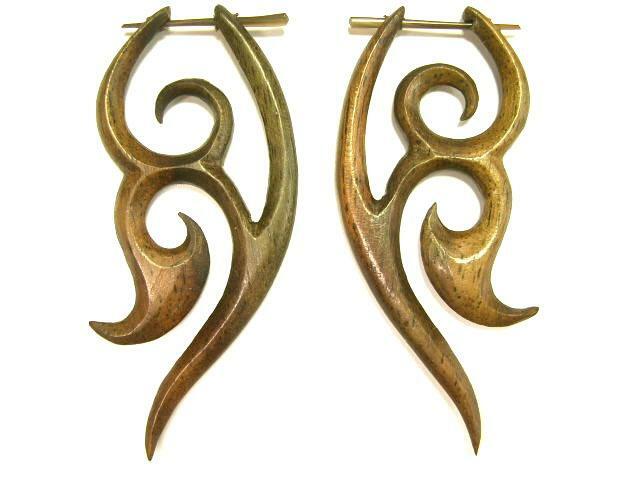 These cool tribal earrings are for normally pierced ears. We have split expander styles that look like they've been threaded right through your ear hole. These are known as cheaters or fakers. Fatastic that you don't have to lose all your jewelry as you move up in gauge sizes, yes? See! They look like real expanders when they are worn! 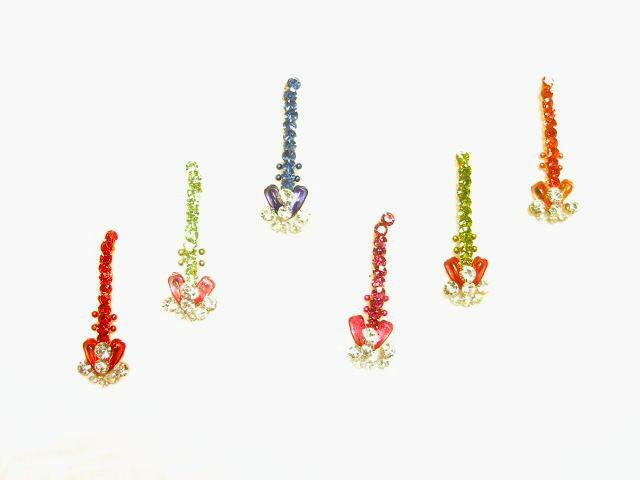 We also have these cool organic pin style earrings. 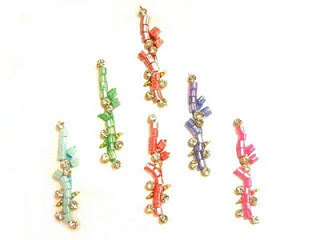 These use a horn or wood stick for the earring post. 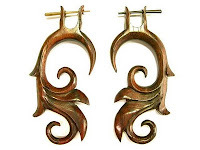 How did we move from Indian shoes, glass bangles, and henna to organic earrings? Glad you asked! A little while back a good friend was dealing with some health issues. To help in her healing process I did quite a bit of healing henna tattoos for her. As a thank you gift, she gave me the coolest earrings I had ever seen! I wore them EVERY day until she bought me another pair for my birthday. 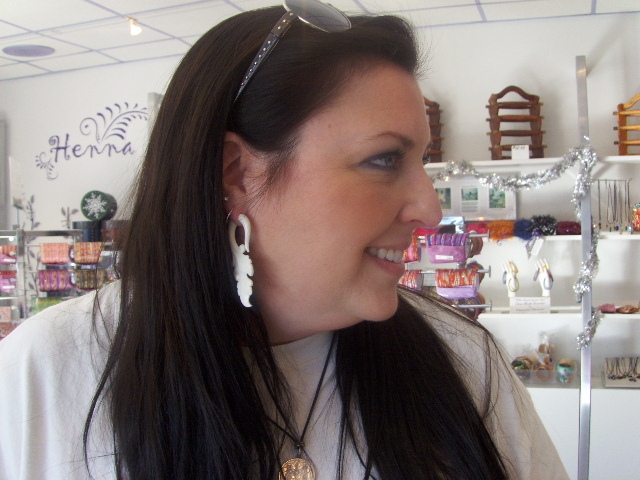 Then I started swapping out my fabulous organic earrings. I got so many compliments on them, that I thought I had better start sharing the wealth (not to mention keep myself in good supply!). 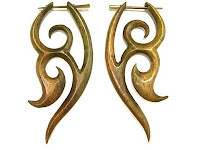 Our tag line for Beachcombers Bazaar is "Be Noticed..." These earrings certainly fit the bill! 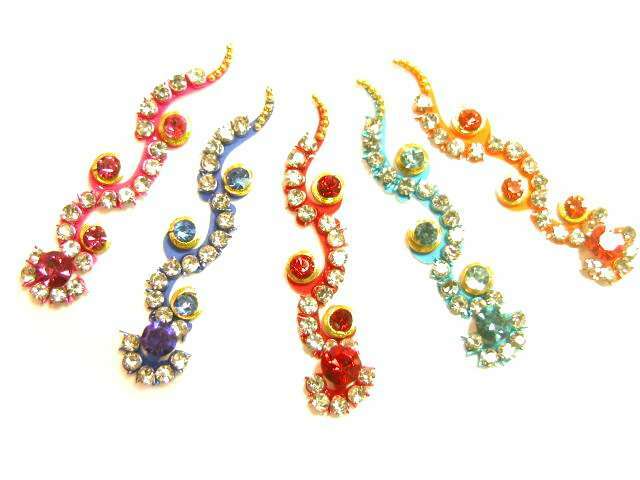 I started looking around for a good family source for the earrings. That's when I found Wayan. What an amazing person! He and his wife started a small art business in Bali in the 80's focusing on his lifelong passion of carving and wood sculpting. These hand carved earrings are now part of his art. That little business is continuing to grow as new family members and other artists from the community are added. Like most Indonesians, the environment and natural resources are important to Wayan. All materials used are harvested responsibly. Wood is from renewable tree farms planted specifically for the purpose. Horn and bone are left over material from farm animals and animals are never killed for their horn or bone. Indonesians (much like native Americans) try to use every part of an animal or plant and waste very little. I'm proud and honored to have added another small family business to our own business family! Give them a try! They make a fabulous unique gift, and you'll be supporting our local USA small family business AND Wayan's local small family business in Bali. This post is for you, Mariem! I was asked a couple of days ago to henna a Unity candle for a fantastic couple I had done some pre-wedding henna on a couple of weeks ago. Amy and Robyn, you are AWESOME! I have never hennaed a candle before, so this required some research. I am certainly no expert so take this advice with a grain of salt and please post any comments, suggestions, or corrections you may have. I was given a standard white pillar candle. 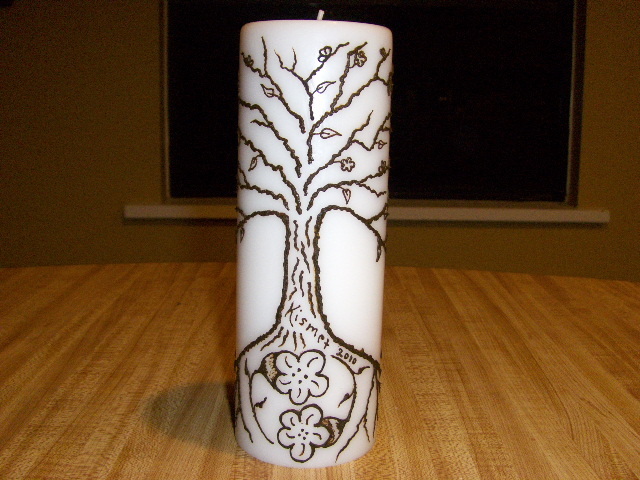 Since I have never applied henna to a candle before, we decided that I would first draw the design with a Sharpie so that if the henna flaked off in the future, the couple could re-henna by tracing the Sharpie drawing. 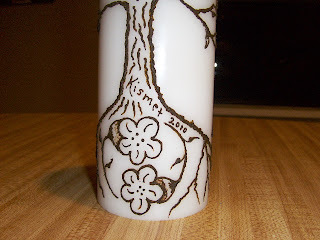 Drawing with the sharpie on the candle...Easy. 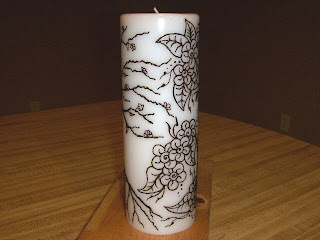 Drawing with henna on the the candle...Challenging! You have to be quite careful about where you can touch without smearing your henna. Takes a little getting used to, but not so bad. 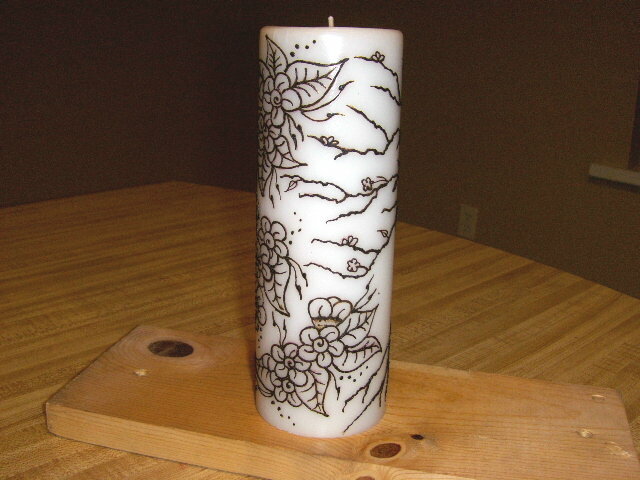 The issue is how to avoid having the henna flake off the candle. Upon doing research I found two main ways to do this. Applying a spray candle gloss such as Candle Kote or Candle Luster, or dipping the candle in a candle sealer. Having never made candles before or dipped candles in wax, I opted to not try it for my first attempt with one one day to figure it out and get it done. 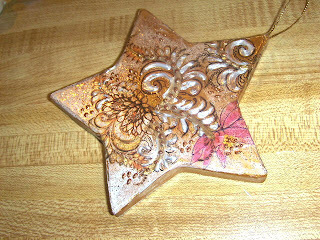 The gloss sprays were not available at local craft store and we didn't have time to order it online, so a clear hard-coat acrylic spray is what we decided to use. I sprayed 5 very light coats of the spray over the entire candle after the henna was completely dry. 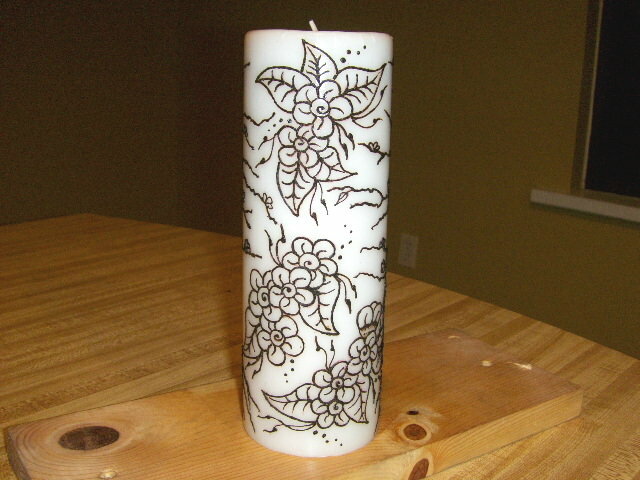 Super easy and the henna seem fairly strong on the candle...for now. I don't think the clear acrylic will be a good long term solution. I toyed with the idea of not using henna, but I love the energy of henna and felt is was more important to have the positive energy part of the wedding than a perfect candle. I won't have time to henna more candles anytime soon, but I plan on learning the ins and outs of this when I do have time. I will, of course, share! 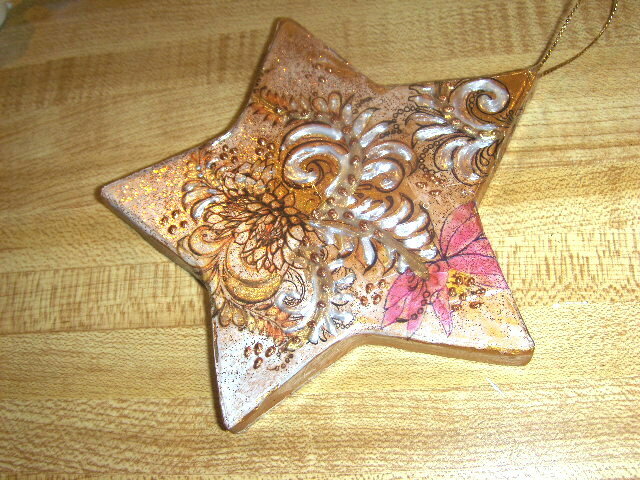 I just finished a beginning henna workshop and what a GREAT class! I had an amazing group of women! Two of the women in class are regular henna customers of mine and allowed me to demonstrate an important fact about henna color. Two days before I gave both Stacy and Shanon henna tattoos. Stacy didn't put any lotion on that day so I hennaed her without cleaning the area first. I used witch hazel to clean Stacy's skin since she had lotion. 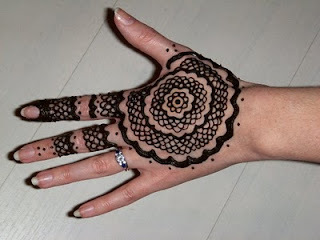 Stacy's henna was brilliantly dark and lovely. Shanon's was rather lack-luster. The exact same henna, the exact same day, and both designs done on the foot and ankle area. I constantly tout that henna takes best on clean dry skin. A quick cleaning can't remove all lotion since lotion seeps into the skin cells, but it's better than nothing. Clean open cells allow a better bond with henna. Think of your skin cells as a glass. If part of the glass is filled with lotion (or water or anything else), not as much henna can fit in the glass. For the best possible henna tattoo stain, you need clean dry skin! Another thing brought up was how the henna tattoo stain on my hand was so dark. 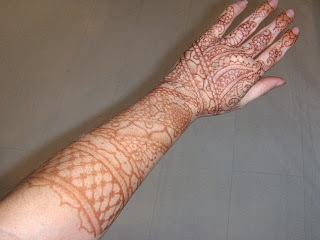 The full answer to that is here http://shophenna.com/new_henna_tips.htm, but though my henna was very dark, it wasn't going to be a long lasting stain. I only left my henna on for less than 2 hours, just long enough to do the design and finish a movie I was watching. Henna paste still on the skin. Henna stain just after paste removal (paste on less than 2 hours). Henna stain the next morning. Henna tattoo stain 3 days after paste removal. 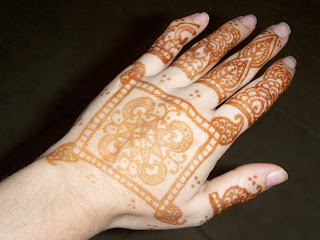 Though I still got nice dark color from my henna it started fading MUCH quicker than normal. By the 4th or 5th day the henna was starting to fade. Granted I was also in the process of installing drywall and mudding and sanding the drywall. This meant plenty of hand scrubbing through out the day. Typically I can expect at least a week of nice deep color from my henna. Henna stain 7 days old after poor care and not leaving the paste on the skin very long. The lesson from this? 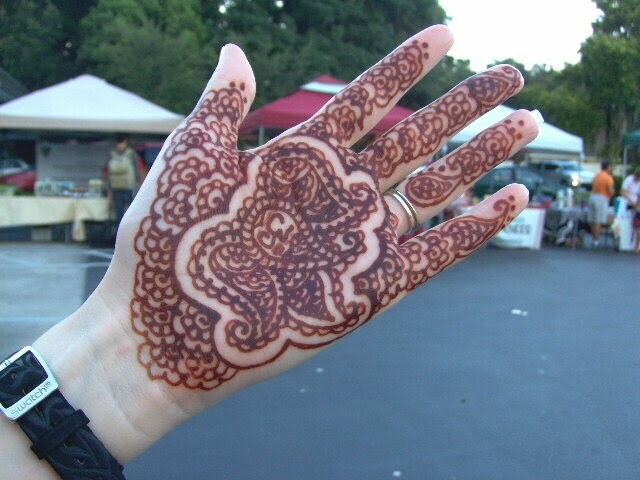 Take good care of your henna for a lasting stain. Leave it on for 4 hours or more and avoid any type of exfoliation. Consider this your October henna reminder! I had a customer come in a couple of days ago who had some light scarring from chemical laced henna she had gotten while on vacation, TEN MONTHS ago! Though I called this light scarring, I don't think she considers the scarring light. 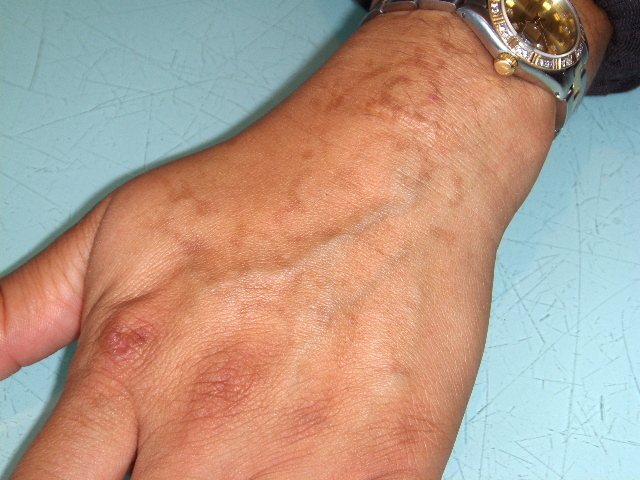 The henna that produced these scars 10 months after application was mixed with benzene, kerosene, or gasoline. She said the henna had a painful burning sensation while it was on the skin. It left a nice deep brown color even though she only left it on for a half hour or so because of the burning. Henna should not burn. It may feel a little itchy on the skin because as it dries it shrinks. It may make your skin feel cold, but natural henna will NOT burn. It should NOT smell like chemicals. Any artist worth getting henna from, WILL be able to tell you the ingredients in their henna paste. Learn more about henna safety on my henna help site. How psyched am I about our newest bindi body stickers? 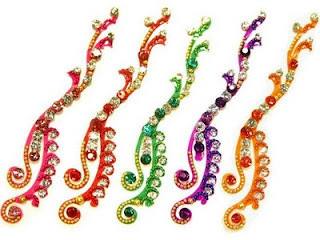 They are PACKED with crystals and are some of our best bindi ever! 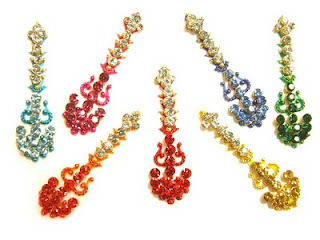 We even have a great Trishula bindi (trident style) bindi for you Yogis and Yoginis out there! Check these out! NINE large bindi with white crystals and colored crystals. I really love these bindi body stickers. 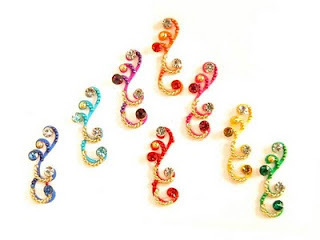 They have lovely iridescent beads covering them. 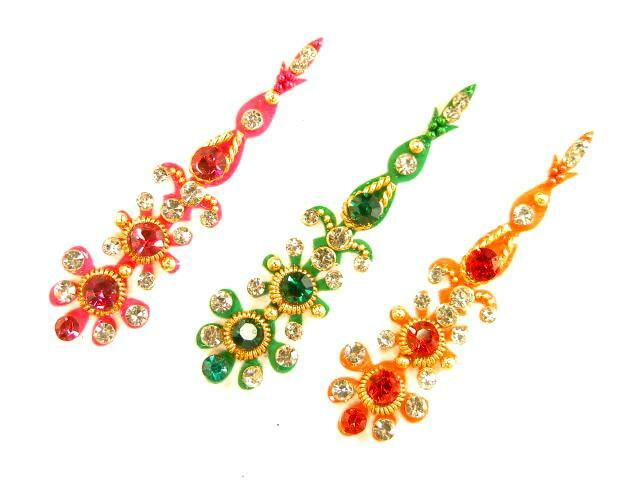 Check out all the new bindi styles here! I know many people do not believe in the power of henna energy. I am here to tell you it exists and is powerful! This henna design uses sprouts for growth and life, peacocks for luck and blessings, open style flowers to accept and attract positive energies. When I create a henna design on someone I try to work with their energy to create a design especially suited to them. When possible, I try to attract the kind of energy that they currently need in their lives. 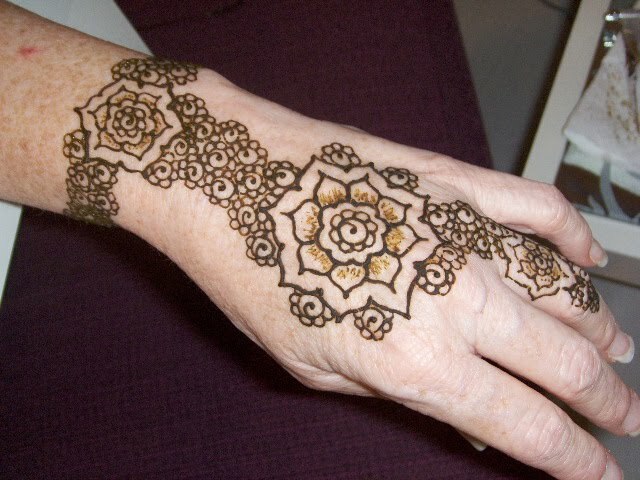 Diane of the YOU Health Center here in Orlando coined my henna, "Henna with Intention", and I think that's perfect! Violet is one of my favorite people to henna. She is simply the best canvas! Every design comes out gorgeous on her! Sometimes that energy needed is healing either physically or emotionally. Other times someone needs the courage to make a change or to take on new challenges in their lives. Sometimes a woman wants to have a baby and needs fertility henna. It doesn't matter the reason for the henna, the point is henna can be part of creating your own reality! Every design I do on Celia is different! She is just layers and layers of energy goodness! You can feel the positive energy flowing when henna is being done! As long as you have color, you should still be able to reconnect with that great henna energy. Nina needed some balance and perspective to help her with big changes in her life. This henna is ripe for tackling new opportunities and staying calm while doing so. When you do henna or have henna done on you, take a moment to reflect about what you need. Concentrate on infusing those energies into your design. Connecting henna and woman power! These two women had a wonderful bond and I was happy to be able to pull connecting elements in their henna. The woman on the right needed some courage and fortitude so we did plenty of spirals. Have fun and happy henna'ing! New clothes, check. New jewelry, check. 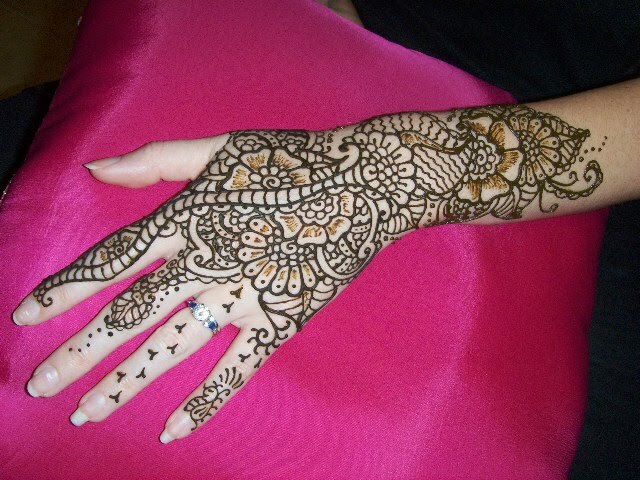 Have you thought about your Eid Henna yet? You can't allow Eid to pass without henna on your hands! You can do your Eid henna yourself, get together with friends and do henna on each other, or you can have henna applied professionally. 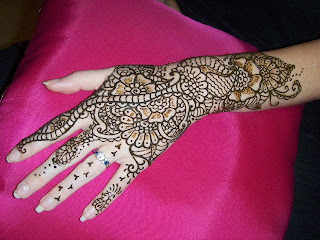 Eid mehndi is best done on the palms of the hands, but you can have your henna applied wherever you'd like. 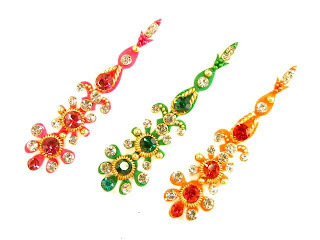 For the best possible color on Eid morning, your henna should be done on the 7th or the 8th at the latest. 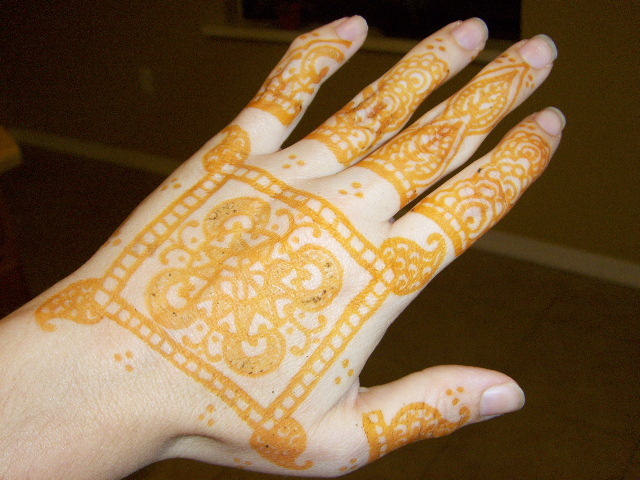 Your henna tattoo needs time to cure and oxidize for full color. Even Monday the 6th is a good day to have your henna done for Eid. 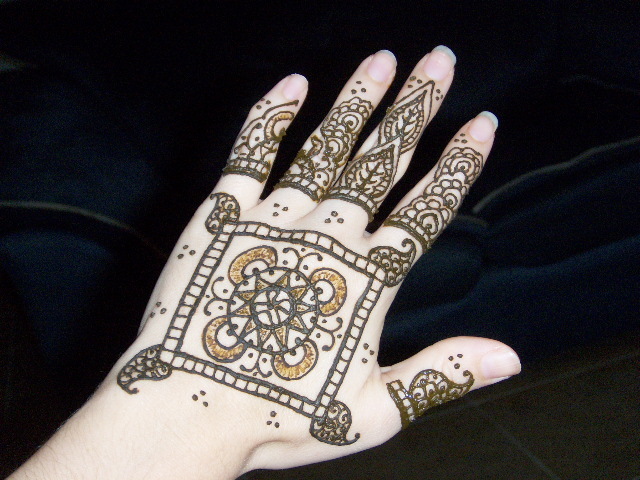 If you plan on doing henna yourself, Friday September 3 is the last day to order henna from Beachcombers Bazaar for priority shipping. 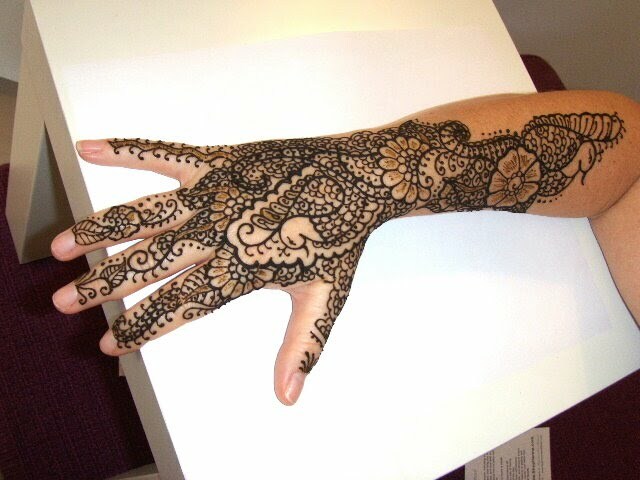 There are still slots open to have your Eid henna applied by Jody of Beachcombers on both Tuesday the 6th and Wednesday the 8th. 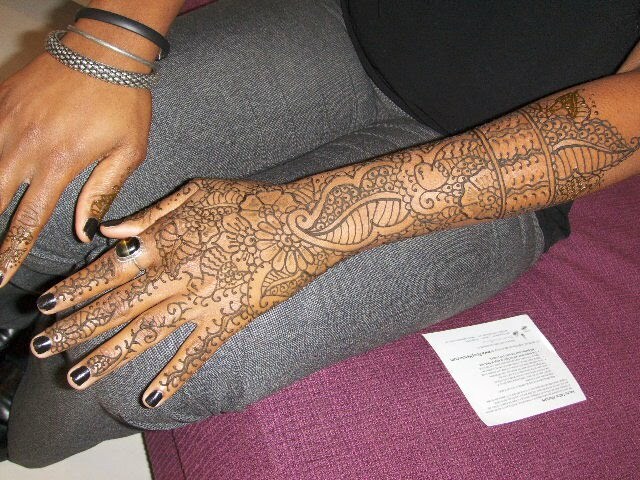 If you want a slot, schedule your henna appointment today! Everyone seems to want super dark color from their henna tattoos. I want to help you achieve this, but keep in mind henna isn't all about color. It's about connecting (with others or just yourself) and contributing to a positive energy within and around us. 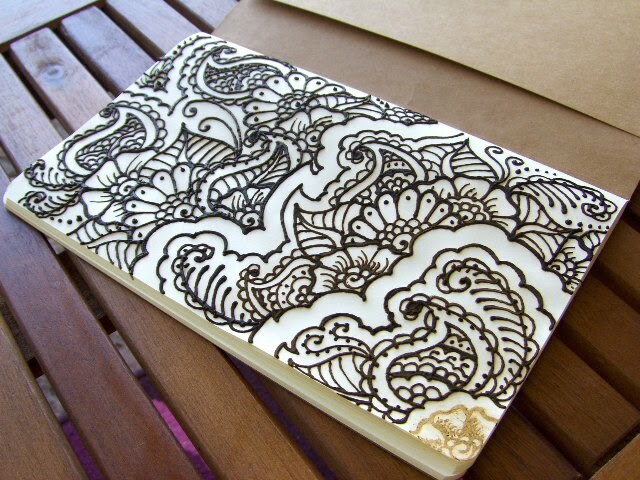 Henna can be as powerful as you let it! Back to dark color henna! There are so many factors that contribute to the color you ultimately get from your henna, we're going to address most of them. Mix Jamila henna powder and lemon juice in a glass bowl. I use lemon juice from the bottle, not fresh lemons. I find I get more consistent results that way and I don't have to worry about clogging. I don't mix exact amounts of henna powder and lemon juice, instead I go for a specific consistency. I add lemon juice until the paste resembles thick mashed potatoes. If you need a general reference for how much lemon juice to add start with approximately equal amounts of each. Reserve a tiny bit of powder in case you need it later to thicken your mix. The acid in the lemon juice helps release the dye in the henna (lawsone). I place plastic wrap over the henna paste and press it down so it is actually touch the paste. I place the bowl in a warm (but not too warm) dry place overnight. The next morning, I can see that I've had some dye release. 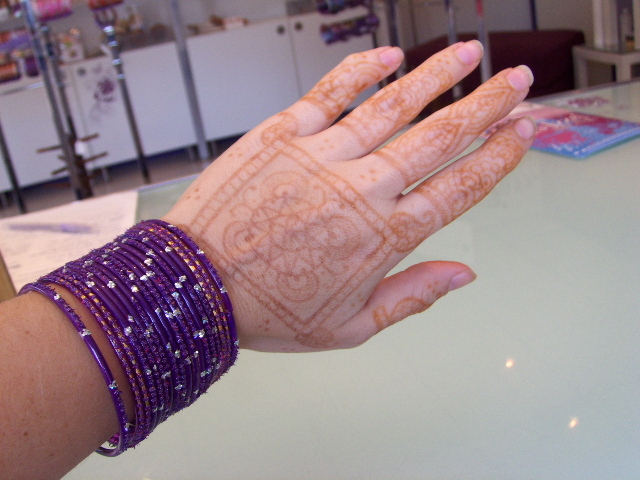 If you are looking at the side of the glass bowl you will see a darker brown ring around the top of the henna. 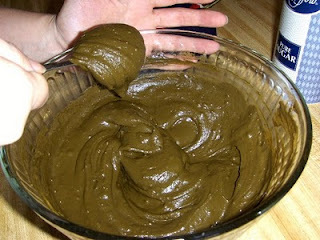 If you take a spoon and scrape a layer of the top henna off you will see a nice brown top layer with fresh green henna paste below. I add regular white table sugar to the henna and mix it in. I use about 1 part sugar to about 4 parts henna. You will find the sugar melts in the henna as you mix it in smoothing out your henna and adding "liquid". The sugar makes the henna stay wet against the skin longer and stick to the skin better, thus helping you achieve a darker stain. I add equal amounts of lavender oil and tea tree oil. Everyone uses a different amount of oil. 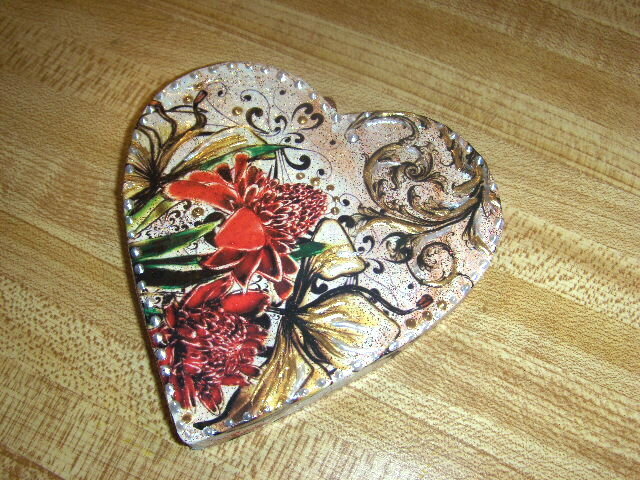 I use about 25-35 drops of each oil for one box (100 grams) of Jamila henna powder. Both lavender and tea tree oils have monoterpene alcohols which will help release more of the lawsone dye in your henna resulting in a darker stain. You can get a great combo pack of Jamila henna powder, lavender oil, and tea tree oil here. I put the same plastic wrap over the henna and let it sit until either later that day or even the next day. I mix it up again and my henna is ready to use! This is a good point for your to strain your henna if you like. Put your henna in individual sized cones and then freeze them. 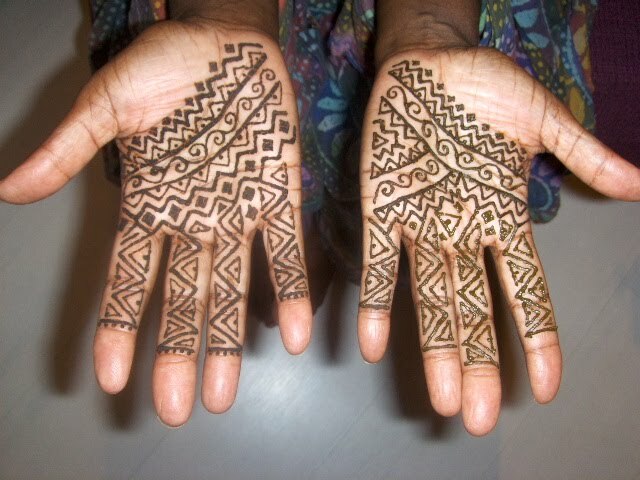 Anytime you need fresh henna, you are an hour of thawing away from fresh individual sized cones away! 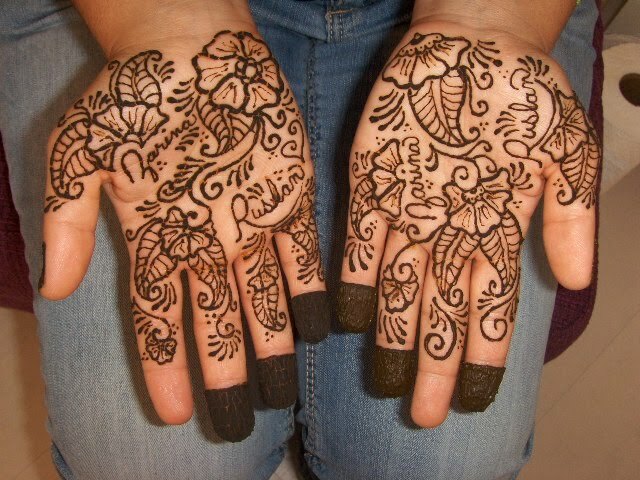 Henna takes best on the palms of the hands and the soles of the feet. The further away from the feet and hands you get, the lighter the stain. The thinner the skin, the few layers of skin cells there are for the henna to stain. That's ok, you can still do henna on the back or even the face, just know that it will be lighter and not last as long. Henna takes best to clean dry skin. 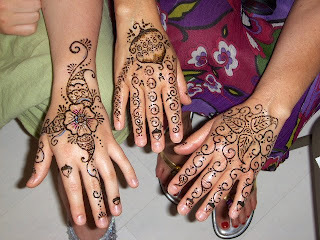 Lotions, sunblock or even water will be a barrier between the henna and the skin. The more base (opposite of acidic) your skin is the darker your henna stain. The longer you leave the wet henna paste in contact with the skin, the darker and longer lasting the color. Ideally I like to see people shoot for 4-6 hours. Overnight is even better! Use a sealer such as a lemon sugar sealer. This will help you develop a nice crust on top of the henna while keeping the underside (that's in contact with your skin) of the henna moist. The warmer your skin the darker your henna stain. I have low blood pressure and I'm always cold. It's much harder for me to get good henna color than it is for most people. Don't crank your air conditioning, and try to keep your body temperature up. Sit in the sun, have a glass of wine or hot tea, wrap up in a blanket if you are like me, lol! The best thing you can do to keep the henna area warm is to seal and wrap your henna design. Dab on a lemon sugar solution to the henna as soon as it's dry enough to touch. 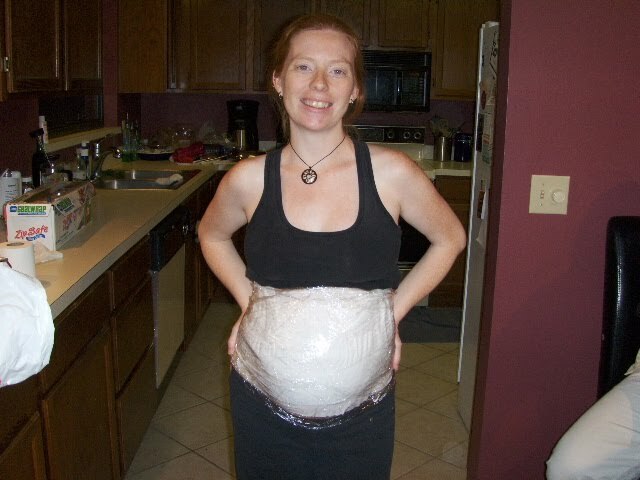 Wrap the design in plenty of toilet paper to absorb sweat and then wrap Saran Wrap around the toilet paper. This can yield crazy-good color! Don't use water to remove the henna from your skin. Either gently scrape it off with your fingers or a spatula or use a little olive oil or mehndi oil to remove the henna paste. I suggest avoiding water on the henna for the rest of the day if possible. Henna is a permanent stain. It doesn't fade away, your skin cells exfoliate off. Anything you do to avoid exfoliating the skin where your henna is will help your henna last longer. Avoid water, cleaners, and anything else that may exfoliate the skin as much as possible (within good hygiene limits). 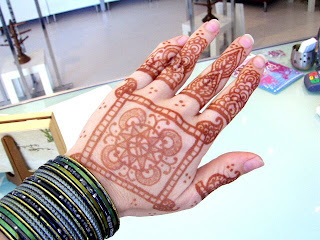 BTW, remember your henna will start off light, but will come up to full color over a couple of days. Be patient! Ahhh...Joy, one of my favorite local Orlando artists! Joy makes these FABULOUS wire wrap bracelets, wrap necklaces, and pendent necklaces. 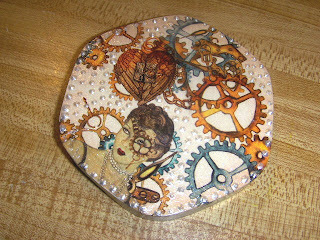 She has a wonderful eye for color and texture and that is why her jewelry stands out. Joy is a beautiful person as well. She always has a bright smile and kind word when she drops in the shop for re-stocking. She is, well, a joy! You can feel her personality shining through her work when you wear a piece of Joy Jewelry. Makes them a GREAT gift! Stop in and see what one-of-a-kind jewelry in stock today at Beachcombers Bazaar.